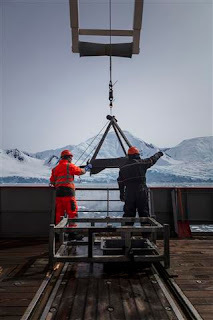 One of the messier biological sampling tools we use in the fjords is the Hamon grab. The Hamon grab is basically a big scoop on an arm which we use to ‘grab’ a portion of the seabed (9 times out of 10 this means a big chunk of mud!). It takes two of us to deploy this hefty bit of kit over the midship gantry. First we remove the safety pin and send it down to the depths. Deploying the Hamon grab over the midship gantry, the metal frame and tray in the foregorund are used to recover the sample. When it touches the seabed, a catch releases and as we haul it back to the surface the arm swings round, taking a big lump of the seabed along with it. Back on the ship we swing the arm back and drop the sample into a tray …. this is where it gets messy. 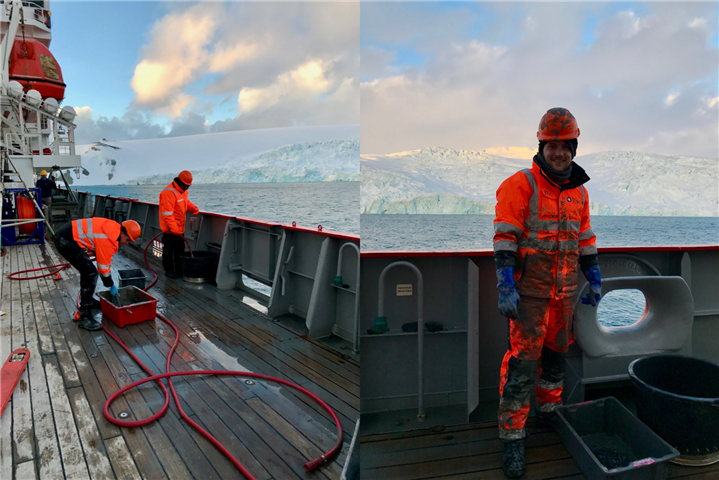 We shovel the sample into a sieve, bit by bit, and use a hose to wash away all of the mud, leaving behind the animals which lived in the sediment (also called infauna) along with lots of stones dropped by melting glacier icebergs. Washing the mud sample through the sieves (left) and Dr. Phil Hollyman showing off the muddy aftermath of a 6-hour grab sampling shift (right). The second half of our team then picks through what is left after sieving, removing anything that is alive and preserving it in ethanol. As the grab sampling is intensive, we don’t have time to fully sort our samples into different species groups at the time; we have to leave this until later. The indoor team picking through our clean sieved samples (left). One of our preserved samples (right). This kind of sampling compliments the other biological work that we do by targeting the animals which live in the sediment, rather than the animals which live on top of the sediment (caught with the Agazssiz Trawl – blog post on the way!). Once we’ve analysed what is in the samples we can see how the communities of these mud dwelling critters changes as we move into the fjords, and how the glacier retreat may have shaped these changes. Recently, we seized the lull in sampling, to start processing our grab samples. Each tub in the picture below is a different species or group of species from one of our mud samples. We found that our samples from Marian Cove were not as diverse as Börgen Bay, which was dominated by lots of different species of worms!